From “One Poem by Hundred Poems as Explained by the Nurse through Pictures”. A Chinese junk off the coast somewhere beyond the Sumiyoshi Shrine near Ōsaka. Two crouching figures can be seen in an opening at the side of the ship. The twilight of the evening makes the scene seem somewhat surreal and dreamlike. In the shikishi next to the series title is the name of the poet Fujiwara no Toshiyuki (died 907) and his waka (Hyakunin-isshu No.18), which tells of an unfulfilled desire for love: In the night his thoughts go out to his beloved, but she remains hidden even in his dreams. 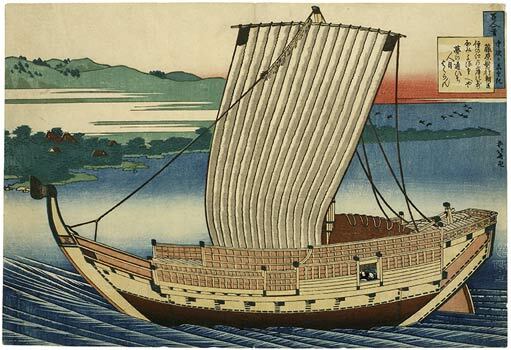 Hokusai seems to have drawn a dream ship, sailing along obvious in the eventide. Two passengers peeping out from the hold, the “people’s eyes” of the poem, seem about to go to sleep as the ship draws night along with it on its journey. Reproduced in: Ingelheim catalogue, no. 118.